Find out which majors have received acclaim at each of the 10 University of California locations. University of California at Berkeley is the oldest UC. It was established in 1868. When considering which UC school to attend, it’s important to weigh factors like location, cost and selectivity, but you should also think about which major you might declare. Check out which fields of study each UC is best known for in order to find the campus that’s right for you, whether you’re applying as a freshman or a transfer student. While you shouldn't feel trapped  by the major you pick when you apply to college, keep in mind that the quality of your particular program will have a huge impact on your overall college experience. The highly ranked University of California, San Diego, is known for three programs in particular: Its computer science program was named 11th in the world by the Academic Ranking of World Universities; its biomedical engineering program was ranked fifth in the country by U.S. News and World Report; and its undergraduate biology program became so popular that the administration recently had to start regulating the amount of students who could declare the major. 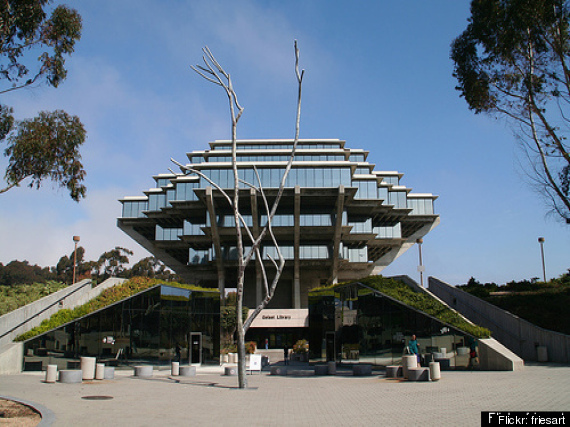 UC San Diego began its life in 1903 as the Scripps Insitution of Oceanography. The 2013 QS World University Rankings ranked University of California, Berkeley, number one in the country for its programs in statistics, which became one of the first programs of its kind when established in 1938; sociology, widely recognized for excellence in teaching about human social behavior; and media, a liberal arts discipline in which students learn about the history, values and structure of media used around the world. The University of California, Davis, is known for its plant- and animal-focused programs; according to its rankings list, the agriculture department was named the best in the country by both QS World University Rankings and Thomson Reuters Science Watch. U.S. News and World Report also ranked the school second in veterinary studies in 2011 and eighth in biological and agricultural engineering in 2013. The first new UC campus built since 1965, University of California, Merced’s programs have been steadily growing since the school’s inception in 2005. The psychology department has made the biggest impression so far; it scored a spot on U.S. News and World Report’s list of best grad schools for psychology. UC Merced is the University of California's newest campus. It was established in 2005. Administrators at the University of California, Santa Cruz, recommend three programs in particular: the astrophysics program, known for its excellent faculty, training programs and facilities; the marine biology program, special because of its proximity to the Monterey Bay Marine Sanctuary; and the computer science program, which was recently ranked fifth in the nation by Affordable Colleges Online. Among the University of California Irvine’s list of distinctions is its recognition from the National Research Council for having one of the top physical sciences programs in the country. Distinct departments in the program include Earth system science, mathematics, physics and astronomy, and chemistry, which is particularly noteworthy: A 2009 report by the American Chemical Society’s Committee on Professional Training named UCI seventh among schools with the highest numbers of chemistry degrees given at the bachelor’s, master’s and doctorate levels. U.S. News and World Report recognized the University of California, Santa Barbara, for its excellent engineering program, and particularly for its offerings in chemical engineering, electrical engineering and materials engineering. U.S. News and World Report also shows that a full 20 percent of UCSB graduates majored in the social sciences in 2012, and for good reason -- the department offers majors in everything from feminist studies to military science. UC Santa Barbara began as the Anna Blake School, which was founded in 1891. The University of California, Riverside, ranks particularly well in two distinct areas: engineering and business. The Leiden Ranking, which assesses the worldwide scientific impact of universities everywhere, ranked UCR tenth for their impactful engineering program, which also got a nod from U.S. News and World Report for being the 67th best program of its kind in the nation. The school’s undergraduate business program has also received recognition -- Business Week named it one of the best programs of its kind in the country. U.S. News and World Report has recognized the University of California, Los Angeles, for its stellar undergraduate engineering programs (particularly in electrical and mechanical engineering) and its world-class psychology department, which was named the best graduate program of its kind in the country. The undergraduate program in psychology is popular, too; a recent study showed that there were 403 more UCLA students majoring in psychology in 2013 than there were in 2007. The University of California, San Francisco, is a unique UC in that it exclusively focuses on health sciences. The medical program is known for four concentrations in particular: U.S. News and World Report recognized its AIDS Research Institute for being the best in the country, and its internal medicine, drug and alcohol abuse and women’s health programs all ranked an impressive second in the nation. UCSF was founded in 1873. Lucy Wanzer was the school's first female student. She graduated in 1876. Make sure to consider this information when deciding which UC school to attend. After all, the quality of your particular program will have a huge impact on your overall college experience...and your future career prospects.